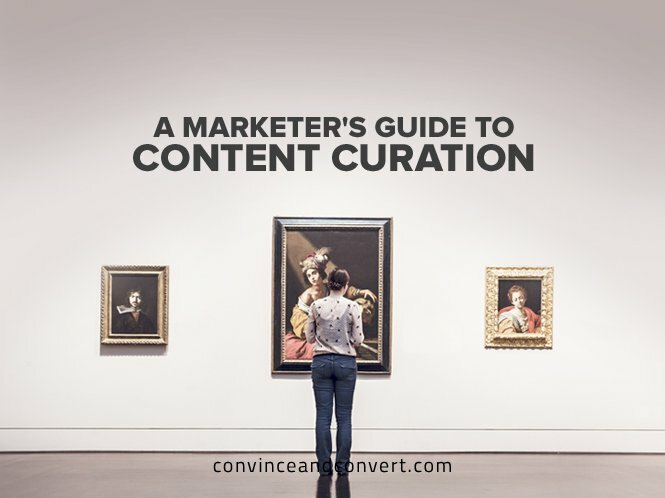 Have you been sold on the benefits of content curation and decided to make it an integral part of your content marketing strategy? Welcome to the club. After all, curation is an excellent way to augment content marketing investments and supplement original content assets. Content curation accelerates marketing initiatives, increases trust, and improves lead generation, while also reducing content development costs. Let’s highlight what each step entails. First, it is essential to identify a relevant topic area. It should be related to your area of expertise, as well as your target market and value proposition. When identifying the types of content to curate, focus on three perspectives. Audience interest: The best place to start is to consider your audience, and what you consider relevant to meet your customers’ and prospects’ needs. Content: Consider the overall landscape, and make sure there is sufficient third-party content in a topic area to be worth the effort to organize it. Competitor landscape: Consider what your competitors are doing. You want to ensure assets are curated in a relevant area that your audience finds valuable and that competitors have not (yet, or adequately) addressed. Curation allows anyone to bring in the best content industry experts have to offer. The topic area should be broad enough to encompass a range of perspectives, while also sufficiently focused to address key concerns. With a well-chosen topic, it should be easy to identify at least a dozen sources by reviewing content you already consume. Be prepared to add new sources, particularly if you are part of a fast-changing marketplace. Curation exploits the link power of the web, so link to related articles on an ongoing basis. Provide a balanced mix of experts, dissenters, and up-and-comers (different views and perspectives) in order to optimize value for your audience. Curating entails organizing content assets and adding value to them. Curating content is, by definition, a human process. Think like a librarian when setting up your categories; tag and group assets, and develop indices about the collections. Be sure to add value to curated collections. Annotate individual items, analyze trends, summarize, ask questions, and provide both insights and guidance. Always attribute sources and provide the links so your audience can easily access them. Set up a process and task somebody with reviewing sources on a periodic basis—daily or weekly, depending on the frequency of your curated postings. This can be quite simple when using one of the many tools available for automating your curation process. Crowdsourcing may also be relevant. Curation is more efficient and effective when your organization considers it a cross-functional practice instead of the exclusive domain of the marketing department. The next step is sharing results with your target audience, utilizing whatever communications channels they prefer. Remember, they have choices. Different segments of any target audience consume content in different ways. Some people go to their inbox first thing in the morning or choose content to read through a newsletter in their spare time. Others rely on Twitter, LinkedIn, or a feed reader to stay abreast of current events. Web sites and microsites that focus on a particular topic are also relevant. Often people will want to browse through entries and summaries to find relevant information. As a content curator, find which channels best suit your audience’s content consumption habits and preferences. Often it pays to invest in a multi-channel strategy, optimized for the strength of each channel. For instance, trends can be summarized in a tweet, and the audience referred to the complete article on a microsite. As a content marketing strategy, content curation is unique because it relies on third-party content developed by external parties. As a result, audience behavior is different from traditional online marketing campaigns where all content is consumed within a brand’s online properties. When it comes to websites and blog posts, it’s still important to track page views and visitor growth to determine the size of your audience and whether it is increasing. But total site visits and length of site visits may be misleading. This is because a few people with a passionate interest are more valuable than many people with a general concern. Similarly, if audience members are clicking through to the third party content, their time onsite does not reflect their actual interest. Similarly, subscriber growth rates and click-through rates are important metrics for email newsletters. Open rates are less relevant, as they do not capture all activity. There are many social media metrics to watch, including followers, fan growth, and retweets. These help to gauge popularity. By using these metrics to assess the performance of content curation initiatives, they can be ranked in terms of reach, conversion, and ROI against your specific business goals. 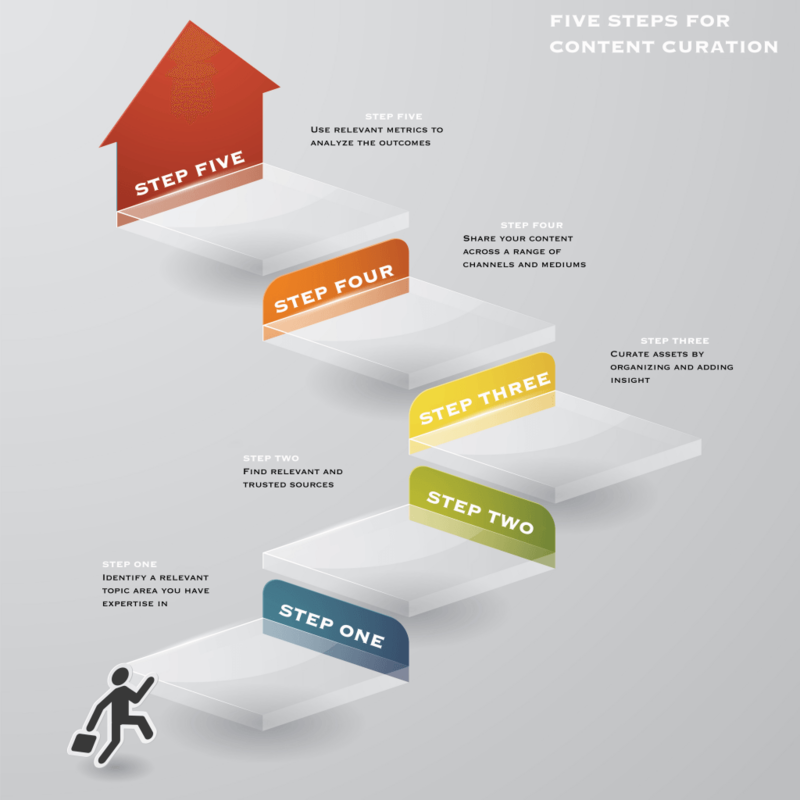 These five steps summarize the framework for getting started curating—a crucial aspect of any content marketing program. For a deeper dive and added resources, The Ultimate Guide to Content Curation eBook will appeal to beginners and pros alike. Pawan Deshpande is the founder and CEO of Curata. His work at Curata has been recognized through the 2010 Boston Business Journal's 40 under 40 Award, and through the Massachusetts Technology Leadership Council's 2012 Sales & Marketing Technology of the Year Award. Pawan has held software engineering positions at Microsoft, Google and other startups where he was awarded patents in social networking and machine transliteration areas. Pawan is also a blogger for Content Curation Marketing, Content Marketing Institute, CMO.com, Forbes, Marketing Profs, and other technology and marketing publications.